Everybody's busy. Our crazy lives run in different directions and it is hard to make time for all the things you really want to do. Our friends, Merri and Walt, and Scott and I ran into this conundrum head on recently when we decided we wanted to drive over to Rising Fawn, Georgia to have dinner at the Canyon Grill. We had heard such good things about the restaurant, but fitting our schedules together proved to be a problem. When we were in town, they were not and vice-versa. Finally, after what seemed like a year, we found a date that fit all of our schedules and made reservations. This restaurant is not on the beaten path. I think we all had cell service problems when we arrived. But the drive over was pleasant and we were all talking so much, it didn't seem like a long drive at all. The restaurant had a southwestern look on the outside with bright neon turquoise and orange lights. On the inside, the tables were covered in real white tablecloths and the wooden ceiling was strung with bright white lights. It was really pretty. We were seated quickly and our super friendly and helpful server brought us water, fresh, warm homemade bread and real butter and menus. We did not order drinks other than tea and coffee, because Rising Fawn is in a dry county. You are allowed to bring your own bottles of wine or beer, if you choose to do so. The bread was incredible! We asked our server about the appetizers on the menu, because we were all starving. After eliminating the mushrooms, which Scott and Merri don't love and deciding that the pizza and chicken appetizers were probably good, but not as interesting, we were trying to choose between the spicy feta dip and the rajas. Actually, we wanted to know what rajas were. Our server told us that rajas were sliced poblano peppers and onions in creamy, spicy cheeses served with roasted tomato salsa and tortillas. She strongly suggested we try the rajas, so we took her advice. We were very happy we did. Walt got the inspired idea to ask about getting an appetizer of fried and grilled shrimp as well, even though they were not listed on the menu as appetizers. No problem! We were so glad Walt had that genius thought. Those shrimp were so good, I'm thinking I am getting them as an entree the next time I visit. Scott and I had just gotten back from a trip to the beach and the shrimp at Canyon Grill were every bit as good, if not better, than the shrimp we had at the coast. They had that fresh just out of the sea taste, the breading on the fried shrimp was just right and the grilled shrimp had a wonderful wood fire flavor. As for entrees, Merri and I chose twin filet mignons in a cognac peppercorn sauce, but we decided Merri got triplets instead. She ordered her filets medium with grilled broccoli. I wanted mine cooked medium rare and got crispy potatoes to go with them. The server explained that the potatoes were baked first and then cut into chunks and fried until crispy. She was right, they were crispy and delicious. I was so busy getting pictures of everyone else's entrees, I failed to get a picture of my potatoes. You will just have to take my word about how good they were. The filets were so tender they practically melted in your mouth and Merri also loved her broccoli. Walt decided to get a pork tenderloin with rosemary garlic sauce and a big wedge of grilled cabbage. We all agreed his pork was perfect and we loved the sauce. Walt also ordered a side of fried okra. The okra was split in half and then fried. We agreed we would like it better if it was crispier. Scott's entree was an Alaskan halibut filet sautéed with lemon butter, white wine and capers. It was perfectly cooked and the sauce was wonderful. He selected lima beans as his side and really liked the way they were cooked with tomatoes. Since Merri and I had been thinking about dessert even before we ordered our entrees, we knew exactly what we wanted. Scott had looked at the online reviews before we left home and he had decided as well, so by the time we finished our meal, only Walt had to make a decision about dessert. Nobody will be surprised to learn that I ordered the bread pudding. This one was an apple pecan bread pudding with bourbon sauce and vanilla bean ice cream. It was also garnished with fresh strawberries and mint and a big plop of whipped cream. Canyon Grill may be in a dry county, but they put the bourbon to that sauce. It was so good! Merri's dessert was also infused with liquor. She had the amaretto brownie with vanilla bean ice cream and chocolate sauce. I have never thought about adding amaretto to my brownies, but I may start now! Her brownie was a chocolate lover's dream. Scott and Walt both chose the coconut cake. Scott asked our server if it was like grandma used to make and she quickly told him, no, it was nothing like grandma used to make. She was right. The moist cake was topped with toasted coconut, Heath Bar crumbles, whipped cream and fresh strawberries. It was like no coconut cake any of us had tasted and it was delicious. This was one of the best meals we have had anywhere. Trust me when I tell you it is worth making time to drive over the state line to Rising Fawn to sample the tasty things coming out of the kitchen of Canyon Grill. 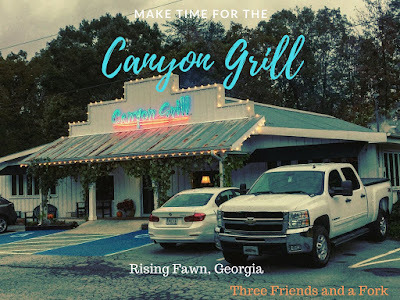 Three Friends and a Fork give 3 Timely Yums UP to Canyon Grill. It was a wonderful experience, from the friends to the service and the food.